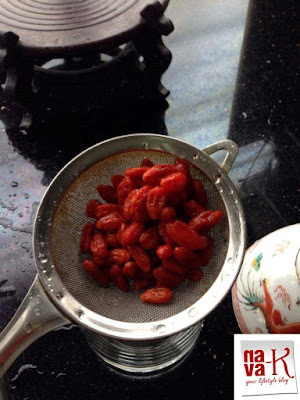 Have you heard of Chrysanthemum Goji Jelly? You know? Or you don't know what I am talking about? If you are Chinese (Honeydew Sago), I think you should know. Nevermind, if all of us are as blank as each other. But I am not blank. I quite know it. Otherwise, how could I have made? 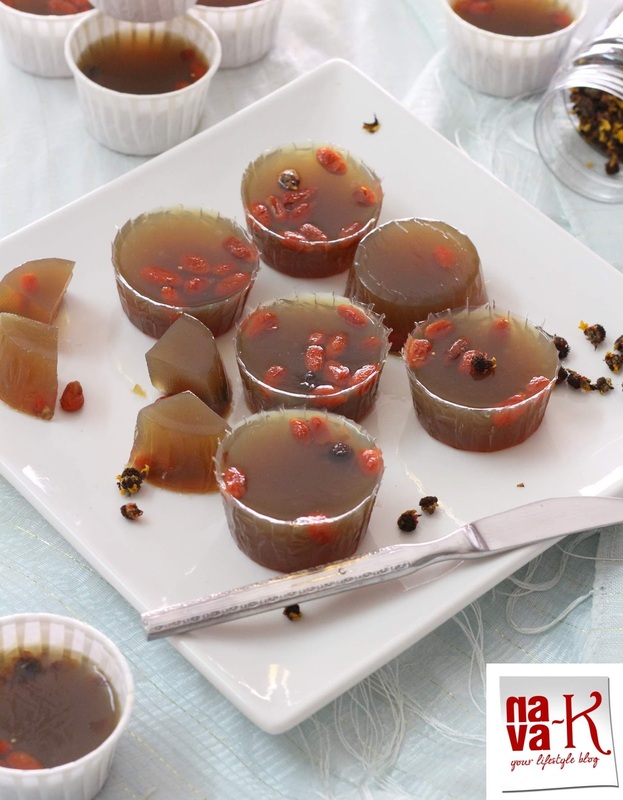 Back then, years ago, Chrysanthemum Goji Jelly was a popularity. Don't know if it is still, but I can still remember and today, my food and cooking mission is to show you how we can make Chrysanthemum Goji Jelly. Actually, come to think of it, I don't think I should dwell too much. Everything you need to know and see? Clearly listed below. Follow me and you can't go or do any wrong. 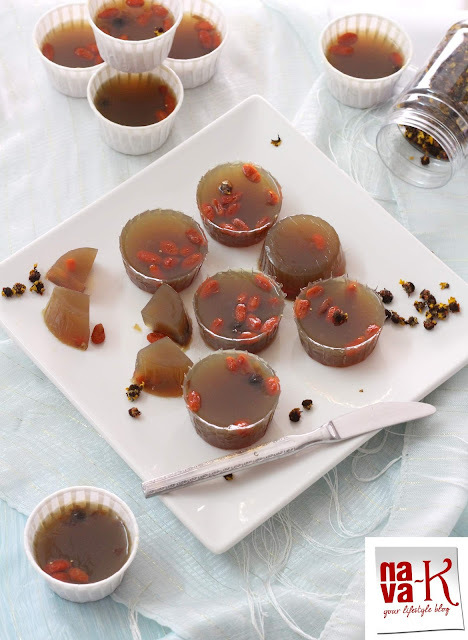 Chrysanthemum Goji Jelly. 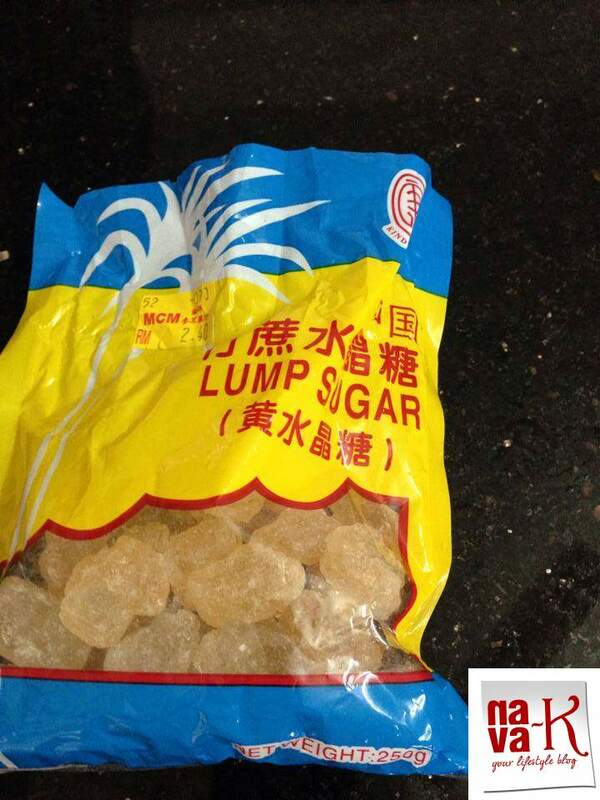 The yesteryears sweet delight. Outstanding for its uniqueness. 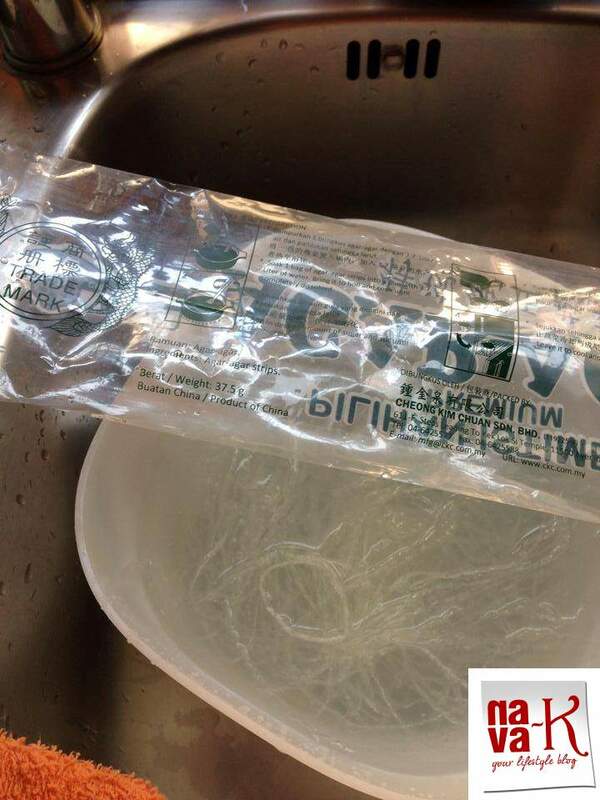 1 packet agar-agar (the standard packet) - soak for an hour and drain off the water. 1/2 cup (or as per taste) chrysanthemum flowers - soak in 1/2 cup of hot water to extract tea. One handful of wolfberries - soak in water for 15 minutes to plum up. Simmer agar agar with 1 1/2 litre of water. 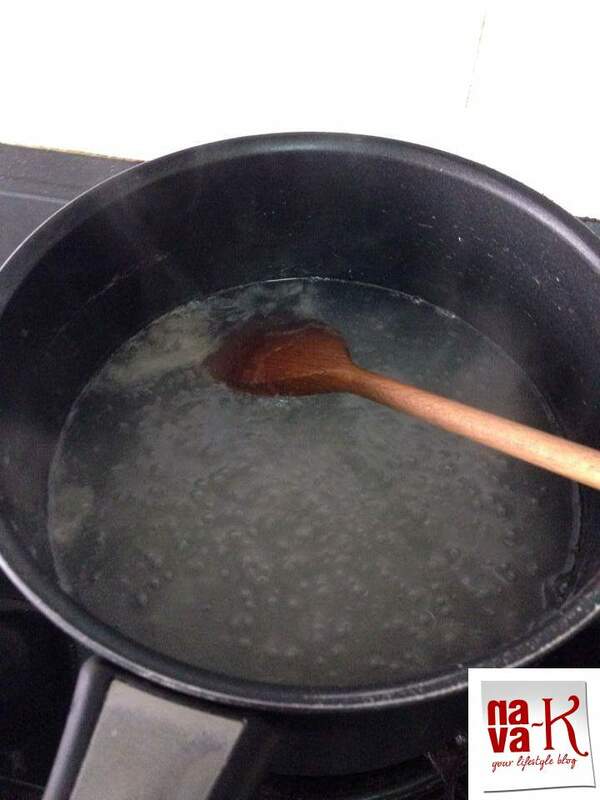 Stir to dissolve agar-agar, strain and pour back in the pot. Pour tea inside and stir again. Then add berries, stir and off the heat. 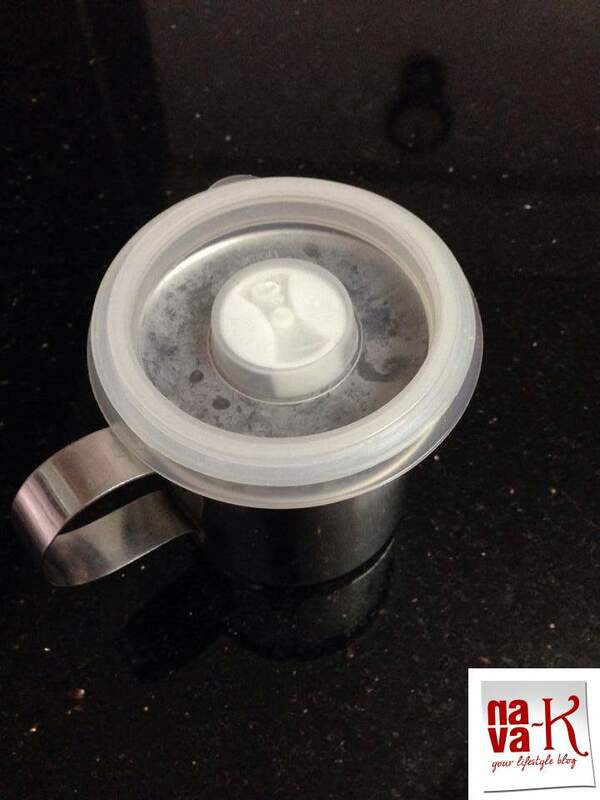 Pour jelly mixture into a big mould or individual moulds. 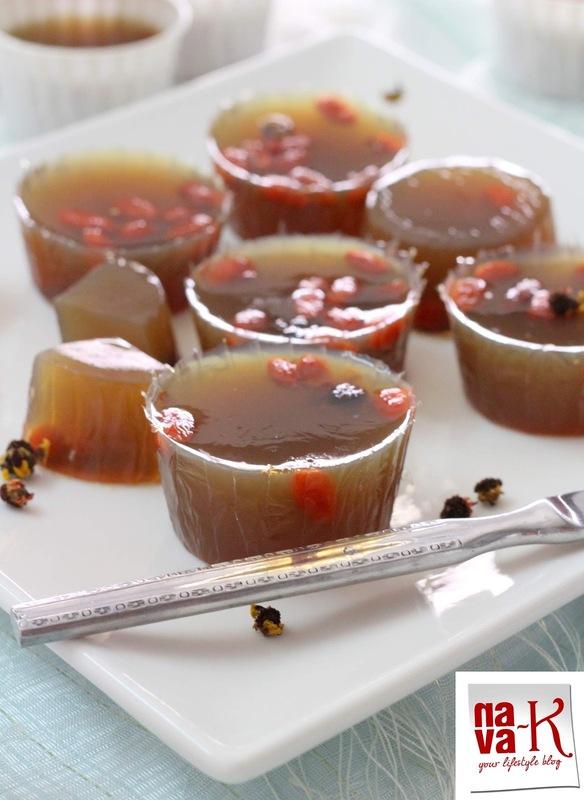 Cool down and gently slide jelly out. For the chilled burst, chill in the fridge. You spoke words of wisdom abt social media & people.. common misconception among people abt bloggers is that we flaunt and share all the time.. not true at all and even u know it..
looks so yummy, BTW i dont find potato sambal recipe on your blog? could you please send me a link. thanks. 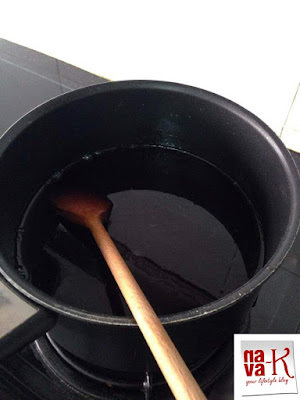 Hi Nava, that's a refreshing and healthy herbal jelly. 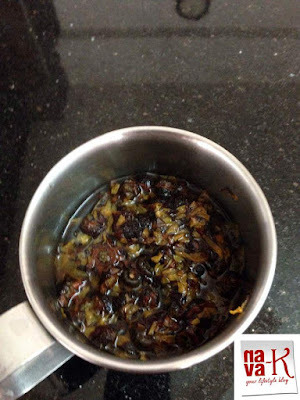 Good for sore throat and fever too. What you mentioned is very true, the stuffs that some people posted online are unbelievable, too good to be true. And there are some, treating blogging like a battle field competing within their own gangs who can cook/bake better. Oh well, thru blogging it help open up our eyes how some people behave in cyber world. Hi 5, glad that we still survive. :)) Happy blogging. The silent observers are the ones I don't understand. Sick! Wolfberries, I have not tried. 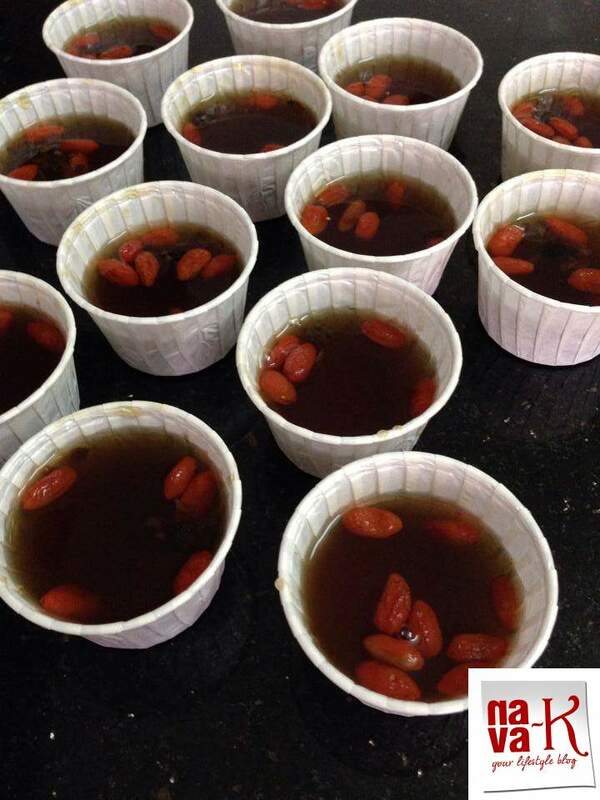 Feel like trying out one from your tray...looks lovely! WOW! They look so cute and YUM!